Welcome to my second blog. 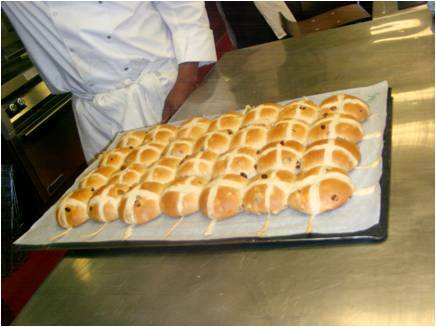 I have posted some details below regarding production of English Hot Cross Buns. Oven Profile: Deck oven; 190°C for 10 - 12 minutes top heat 5, bottom heat 5. Dampers are closed, no steam used. In a large bowl, and crumble and dissolve the yeast into the warm water, then whisk in the sugar and flour to form a batter. Cover with cling film and set aside in a warm place for half an hour. Weigh the dried fruit into a separate container. Weigh all the other ingredients for the final dough directly into the mixing bowl. You need to use the strong flour to ensure the high liquid content is taken up. Attach a dough hook, add the ferment to the mixing bowl contents, and mix for 2 minutes on slow speed to form a soft dough. Scrape down the bowl to ensure all materials come together in the mixer. Turn the mixer onto a higher speed; no more than 3rd speed should be necessary, and mix for 8 minutes to form a smooth, elastic and soft dough. This dough is very soft, so care is needed to ensure thorough scraping of the sides of the bowl. Mixing should result in the soft dough eventually pulling away from the bowl to allow the hook to do the development work needed. It is quite difficult to mix this dough by hand, but a Kenwood Mixer, or a Kitchen Aid should do the job providing the scraping down is thorough. Take the dough off the mixer and store in a bowl lined with a little shortening to condition the dough. Allow up to half an hour for this. Place the dough on the bench, spread it out and pile the fruit on top of the dough. Fold the dough over the fruit to encase it. Then, take a scotch cutter and cut the fruit into the dough until it is very evenly distributed [see attached photo; this is an excellent way to add fruit without damaging either the fruit pieces, or the strength of the dough]. Scale the dough off into 65g pieces, and mould each piece round. Place the dough pieces close together on a baking sheet so they will kiss, and batch together when they bake [6 x 3 on the baking sheets normally used]. Brush with a little milk if you like, or beaten egg for extra colour. The glaze at this stage will particularly help if you have no enclosed prover. Set to prove for 40 - 50 minutes at 38°C, 85%rH, in a prover. Meanwhile make the crossing paste by crumbing the fat with the flour, then whisking this with the water to form a smooth paste [AP will be fine]. Empty the contents into a disposable piping bag with a very small hole cut in the end. Pipe up and down, then across back and forth to form crosses on the top of the buns [see attached photo, and the accompanying video link]. As the buns bake, dissolve the sugar in the water to make the stock syrup. Bring this to the boil in a pan and remove from the heat. Brush the baked buns with the hot syrup as soon as they come out of the oven [see attached photo]. 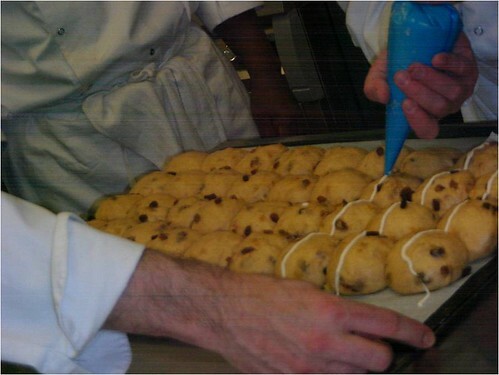 Here is a video demonstration of how to pipe the crosses onto the buns prior to baking. Great and thanks for sharing! However, now after watching the video I am curious too, as to what "airline" meant? You stated you would explain to the class after placing buns in the oven. In large bakeries, there will be a supply of pressurised air next to the ovens. This allows bakers to make up large quantities of the crossing paste mix in pressurised containers, then attach these to the airline. The container will also have a line out, which has a gun like device attached to the end [think very fine hose-pipe, which we use for watering our gardens, although I'm not sure if you will use the same term in the US??] 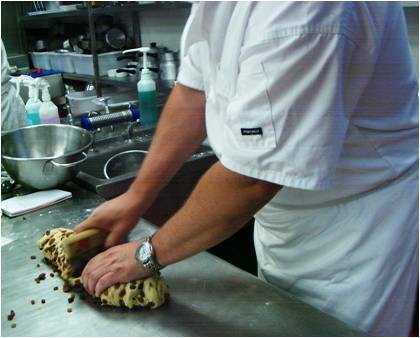 This then allows the baker to pipe a large amounts very quickly and easily. Thank you. I thought I was on the right track earlier but wanted to make certain. However, I didn't know that this would be the case, i.e., using a pressurized line to pipe, it makes sense! Thank you for clarifying and sharing. thanks for those hot cross buns...i was in fact just thinking of what to prepare for breakfast this coming saturday. weekend breakfasts are kind of special to me. the video insert was helpful! doing aeroshow deep dives over the rolls trailing dough. Can the airlines be hooked up to a long needle and air pumped into a loaf as it goes into the oven? ...making it hollow? maybe that's the secret to making great "wonderbread"???? Oh Andy! You used "that" word! Quickly, grab some crumbs and throw them over your left shoulder! Which word? Oh you mean "great" don't you! Well these buns are pretty good; nice of you to go that bit further and classify them as great. I won't mention the other word again...ever, I promise! Is it possible to use active dry yeast? Try 3g Instant, or 5g Active Dry? Fresh yeast is a popular choice amongst UK bakers; personally, I find the dry alternatives slow to respond, and sometimes giving over yeasty flavours. I know not everybody shares this point of view. But remember, this is an enriched product, so the yeast activity has to flourish in the face of adversity. It is also quite a short fermentation period allowed. I'm wondering if I could use real milk instead of milk powder. I don't bake too often maybe every couple of weeks. I never have anything else I would use milk powder in so I can't see going out and buying some just for this recipe. Thats the same reason I wondered about using dry active yeast versus fresh yeast. I've been looking up "Scotch Cutter" and for the life of me the only thing I find is a tool for cutting tape. Do you know of another name for this tool? Looking at the picture didn't really help. Yes you can use milk...use it in the ferment at the specified temperature. You may care to scald the milk first, then let it cool down. That way potential enzymatic activity will be prevented.